Holiday meals are all about the food - and the presentation! As a company who specializes in fine tableware, kitchenware and home accents, we want to make sure our chef's kitchens are well stocked with useful kitchen accoutrements of the highest quality in regards to both form and function. 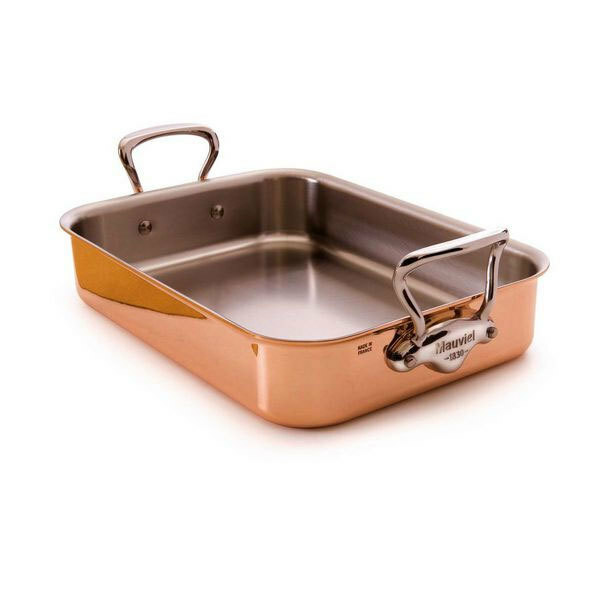 Hence, our holiday chefs will all be cooking in style this holiday season with a Mauviel roasting pan. The well-dressed table before the meal. The bird or entree of choice coming out of the oven. The aforementioned table laden with delicious food and contented guests. Either of the roasting pans from Mauviel will make Picture #2 that much more complete. It is offered in two sizes, both of which are made from 18/10 stainless steel interiors with a beautiful polished copper exterior. Copper heats faster and more evenly than most other metals and offers superior cooking control. The roasting pans can be used on both gas, electric and halogen stove tops, as well as in the oven, and they come with a lifetime warranty. One of our favorite features are the over-sized handles, which allow the cook to have a firm grip, even with the added padding of potholders or oven mitts. They are available in two sizes. The larger roasting pan is 13.5 x 9.1-inches with stainless steel handles. The smaller is 11.8 x 8.6-inches with cast-iron handles. Continue browsing the Didriks website to satisfy your kitchenware needs before the holidays. 'Tis the Season for Savory Soups!